It turns out there is quantitative proof academia, Hollywood, and the media actually are dominated by liberals. In a data set provided to Business Insider, the non-partisan political analytics firm Crowdpac used information about federal campaign contributions dating back to 1980 to determine the political biases of various professions. 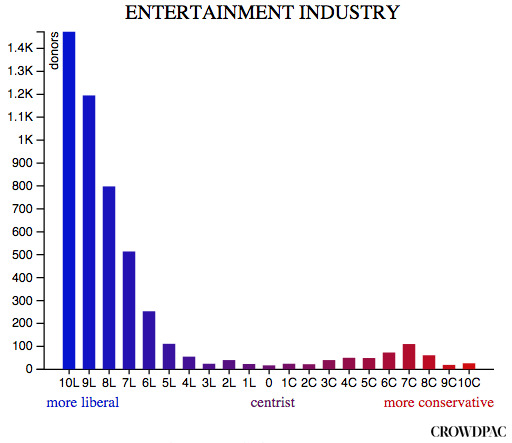 Crowdpac found the entertainment industry, news media, and academia were among the most liberal professions in America. Crowdpac CEO and co-founder Steve Hilton noted this data matches with perceptions about Hollywood and the media. Indeed, a Gallup poll released in September found trust in the US news media is at an all-time low and 44% of Americans believe it is too liberal. Liberal donors absolutely dominate conservative donors in the newspaper and print media industry. Crowdpac’s data set, which includes donor records going back to 2004, includes 1,743 donors to the right of center, compared to 8,976 donors to the left of center. 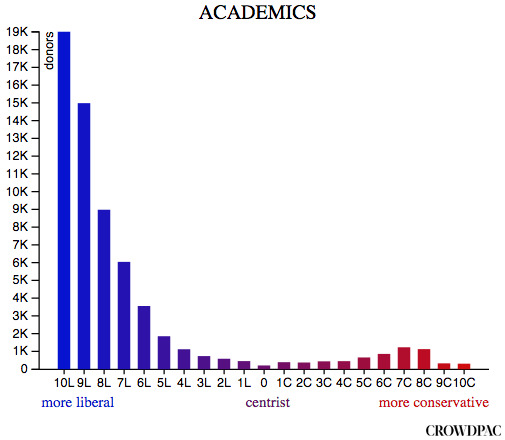 The liberal donors are also strongly concentrated on the far left of Crowdpac’s spectrum.